The areas that I found an still find the most difficult is solving a quadratic equation using the completion of squares method. I find this the hardest out of the three because there is almost no pattern and you tend to do many things to the formula at once. To use any of these three methods you must have the equations equal to zero making it quadratic. The Equation does not always need to have a degree of 2 it can be also solved to the degree of 1. To check your answers plug your (x) value back into the formula and make sure the left side equals the right. 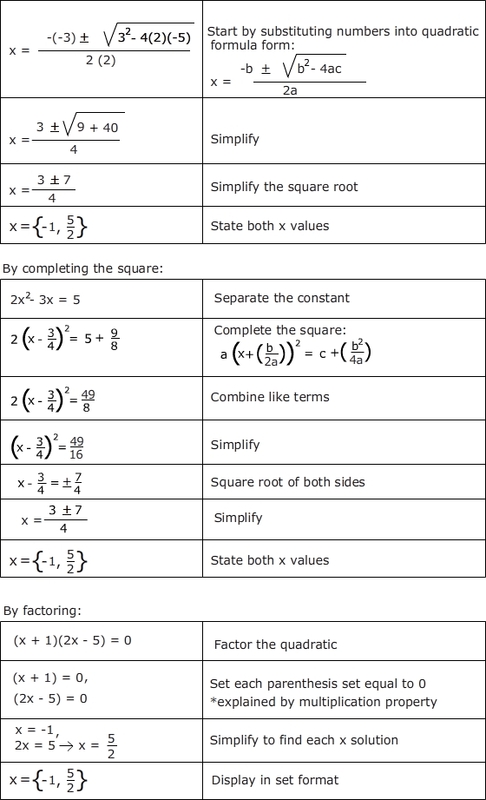 Below you can find examples of the 3 methods of solving for a quadratic formula.